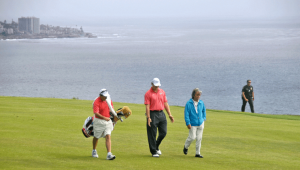 Build A Conservative Game Plan: Many golfers choose to use a more aggressive golf course management strategy simply because it sounds like more fun. After all, who doesn’t want to try for all of the par five greens in two shots, or try to drive the green on a short par four? Aggressive shots might be exciting and look great in front of your friends when you pull them off, but they are rarely the smart play. If you are like most amateur golfers, you don’t possess the consistency in your ball striking to take on challenging shots hole after hole and escape without doing some major damage to your scorecard. When you are putting together your game plan for a given round, look for the most conservative path first. Once you have figured out the safest clubs to hit on each hole, and the safest targets to pick, then you can mix in a few more aggressive decisions if the opportunity presents itself. When in doubt, always opt for the safer shot, trust me your score at the end of the round will thank you. Leave The Next Shot Uphill: Once you are inside 50 yards or so from the green, ideally you want to be playing uphill as often as possible. Short shots are almost always easier to negotiate when they are played uphill toward the hole, as opposed to down the slope running away. Speed control is key on short shots, and you will have more of a margin for error when you are playing up the slope. So what does this have to do with golf course management? Simply put, it’s your job to position your ball below the hole as often as possible throughout the round. Try picking targets that error on the side of being below the hole, so you can enjoy the benefit of chipping and putting uphill more often. You won’t always be able to position your ball successfully in this way, but the more you can do it the better off you will be! Don’t Short Side Yourself: Just like the idea that you want to be playing chip shots downhill as little as possible, you also want to avoid chipping from the short side of the green. For those who are not familiar with the term, the short side of the green is the side which is closest to the location of the pin that day. Without much green to work with, you will likely have a harder time chipping the ball close to the hole, and therefore a harder time getting up and down to save your par. Avoiding the short side is another reason to lean toward using a conservative game plan throughout the round. When you play away from the pin with your approach shot, you will naturally be aiming toward the wide side of the green, and will be less likely to wind up short sided. 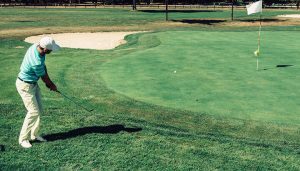 Avoiding the short side is a common golf course management tactic among professional golfers, and you would be wise to add it to your game as well. Think A Couple Of Shots Ahead: Often it can be our tendency to try to cover as much ground as possible with every single shot. The problem with this strategy is that it can lead to taking a number of undue risks. In general, this type of action usually stems from only planning one shot at a time instead of creating a better thought out strategy. For example, think of a time when you’ve been faced with a long second shot on a par five. Perhaps your ball has landed just off the fairway and is sitting in a challenging lie in the short rough. Ahead of you is 270 yards to the green (a distance you can’t reach even with your best 3-wood swing). Chances are you’ve been in this position before and you’ve grabbed the 3-wood out of the bag thinking you might as well smash it as far as you can and try to get close enough for a short pitch shot. The problem with this decision is that you are introducing a lot of unneeded risk into your game. Hitting a 3-wood out of the rough is a difficult shot, and the low loft increases your chances of not getting the ball in the air, as well as generating quite a bit of side spin. All this leads to an increased chance of an errant shot that can require quite a bit of work to just save par. Now let’s try a different method instead. Faced with the same shot try thinking through the hole backwards by trying to envision what shot you would feel comfortable playing next. In this case, perhaps you know that you could easily hit the green from a fairway lie at about 125 yards out. Given that you are currently 270 yards from the green, all you need to do to set up that next shot, is move the ball another 145 yards! This is something which can be done fairly easily with a high lofted iron (a club that’s far easier to hit from the rough than a 3-wood).